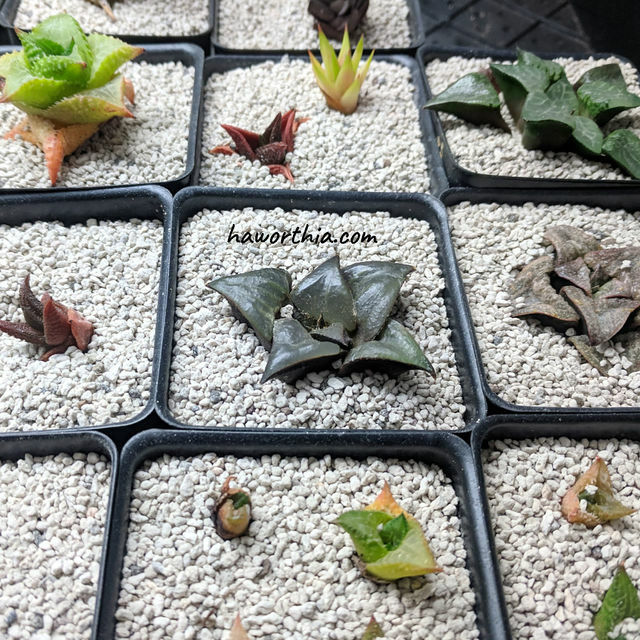 Haworthias are relatively easy to root comparing to other succulents. It is important to have mild weather over the next ~3 weeks after starting rooting. A too high or too low temperature reduces activities of plants. This slows down rooting and reduces the resistance to pathogen infection, leadding to rot. Pruning roots if needed before rooting. If a plant has wounds, make sure that calluses have developed. Unrooted plants put in finer-grained pumice. They are kept under grow lights to keep a cool temperature. The plant should be kept in a cool and shaded place during the whole rooting process. Strong sunlight moves auxins to the top part of a plant and slows down rooting. It is recommended to use a rooting medium with particles in 1~2.5 mm size range. The size range is smaller than the ideal range for growing mediums and better for newly developed roots to ramify. Moisture in the root zone is the main trigger of rooting. On the other hand, excess water also increases the chance of rotting. The safest way is to put in the plant in a rooting medium that is slightly wet and keep in an enclosed space with high humidity. If high humidity is not possible, in every watering supply only a small amount from the side of the container. In every ~2 weeks, take the plant out and check for new roots. Once roots have developed, remove the rooting medium and transfer the plant to a growing medium. After that, gradually increase the water supply and the light intensity.